Psychic TXT & SMS Message Service UK How Does It Work? The procedure is as simple as it can get. You need to send us a text requesting the service(s) that you need. This text should also be accompanied by your name and birthdate so that our psychics can start working on it right away. However, it must be remembered that our experts receive numerous requests throughout the day and you can expect some waiting time before you receive your reading. Please do not grow impatient as all our psychics work to the best of their capacity to ensure that you have the answer to your question as soon as possible. 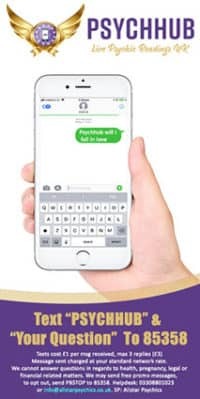 Once our psychics find the possible solutions to your problems or answers to your questions, they will send you the same via one or more text messages. However, there is one thing that you should consider here. Since text message content is insufficient, and so is the number of texts that we can send to a particular number, expect the readings and answers to be brief and to the point. So, if you have multiple questions to ask, it would be best that you sort them according to their priority and ask only a couple in a day. This way, you will be able to receive comparatively elaborate readings and solutions that are bound to satisfy and guide you. Getting your psychic text reading at Psych-Hub is very simple. Given below are the triggers that you can use to get quick solutions to your problems. If you are looking to receive a Snapshot reading from our expert psychic readers, you can send us a text at 85358 with PSYCHHUB, your Name, and Date of Birth. If you want to know how your love life is going to be, you can just text us at 85358 with LOVEHUB followed by the question that you have. To know more about your future financial status and manage your present conditions you can text MONEYHUB followed by the question you have to 85358. 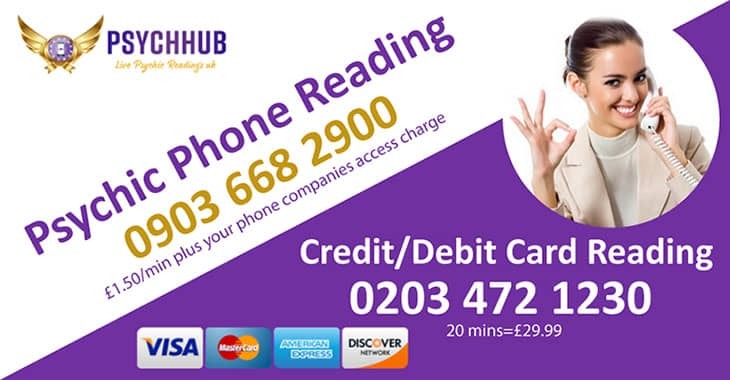 To receive a tarot card reading from our card readers, merely text TAROTHUB and your name and birthdate to 85358. For receiving predictions and solutions to problems related to your career and professional life, send an SMS to 85358 with workhub and the question you have. Texting A Psychic In The UK Is Easy With SMS & Our Instant Messaging Service! Do you want to unravel the deep mysteries of your life and want to understand how different powerful forces interact with each other to mold your life the way it is? Well then, psychic readings can help you do just that and maybe even more. Expert psychics across the world are adept at explaining the actual causes of the problems that you are in and what can be done to get relief from the hassles and progress towards a happier and content life. But setting up a meeting with a psychic every time you have a pressing question in mind becomes very difficult. Not only will you need to wait for quite some time for the appointment, but also will have to spare valuable time from your schedule to meet the psychic. As such, achieving a reader very often is quite impossible. Does that mean that you cannot get advice as and when you need? Do you need to struggle with the various problems of your life without an idea about what could solve the problem? Not at all, because we, at Psych Hub, offer psychic text reading services to our clients. What is psychic text reading? If you aren’t quite sure about what it means, then let us tell you that it is a very convenient way to receive your psychic readings without having to visit a psychic personally. The readings are sent to you via text or SMS so that you can continue with your daily schedule while still receiving the psychological advice that you need to solve your problems. The remote operations ensure that timing or location do not limit you in any way. You need guidance; you got it. What Type Of TXT Messages Does Psych-Hub Accept In The United Kingdom? 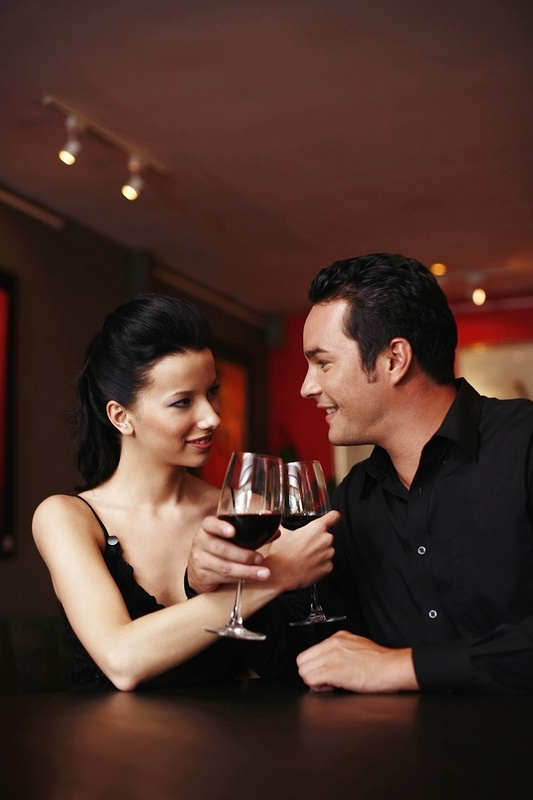 For live clairvoyance reading from our experts, text CLAIRHUB along with your name and birthdate to 85358. If you want to receive an astrology reading, then SMS us at 85358 with the text ASTROHUB along with your name and birthdate. Why is psychic text readingan excellent choice? The first and most important benefit of a text reading is that you do not have to visit any facility to get your reading. This means no prior appointments and no waste of time. A text reading allows you to request one on the go. You can receive it on the go as well. You can receive advice on anything that might be troubling you; nothing is too significant or negligible. You get quick guidance if you are in a dilemma. So, there is no chance of a wrong step in your life. It must, however, be remembered that the readings of one psychic may vary from the other as different people see things differently. So, if you have received texts from various psychics, it is entirely possible that you will be confused about what would be right for you. A psychic can, in no way, determine which advice would be the best for you. They can only offer their information regarding the questions that you have or the problem that you need to be solved. As such, it would be prudent that you stick to a particular service like us who have skilled psychics to offer any assistance that you may need. This will help you find the right path and stay away from any confusion. Also, remember to be courteous to the psychic offering you the text reading as our esteemed experts deserve nothing less. Any disregard of the same wouldn’t be accepted. Also, remember that our psychics cannot offer legal or medical advice and request for the same wouldn’t be acknowledged. So, if you want a deeper understanding of the situations that you are faced with and want guidance for the same, avail our psychic text reading service today.